Incredible Power at Your Finger Tips! 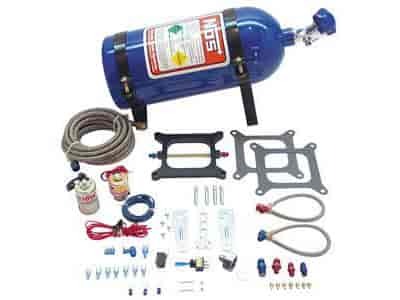 NOS Big Shot Nitrous System is the world's most powerful plate nitrous system. NOS Big Shot systems use a special "fogging" plate design that utilizes a unique spray bar equipped with tiny orifices for precisely dispensing a powerful nitrous/gasoline mixture for unbelievable horsepower gains. Power output is adjustable from 190-300 horsepower simply by changing fuel and nitrous jets. Note: High cylinder pressures are generated with the use of these kits, this greatly increases the load on internal engine components. Forged internal engine parts are mandatory!